It is said in the Jane’s Defence Weekly that the Republic of China Navy (RoCN) took delivery on 23 January of a newly completed fast combat support ship Panshih (磐石) AOE 532 (AOE, acronym used in the U.S. Navy). Panshih was built by state-owned Kaohsiung-based shipbuilder CSBC Corporation at a cost of $130 million. Construction began in 2011 and the ship was launched in 2013. According to the Ministry of National Defense (MND), Panshih AOE 532 is a multirole vessel and will be used as a transport, maritime rescue, and humanitarian assistance vessel. Defence officials say the navy will begin training personnel this month and that the vessel will enter full operational service by March. Panshih is 643 ft/196 m long and 82.7 ft/25.2 m wide and has a full load displacement of 20,800 tons (light displacement around 10,000 tons). AOE 532 can carry a crew of up to 165 sailors at maximum speed is 22 knots/25 mph/40 km/h and has a range of 8,000 NM/14,816 km. Panshih is able to replenish two ships at the same time. Prior to its delivery, the RoCN had only one operational supply ship, Wuyi, which entered service in 1990. 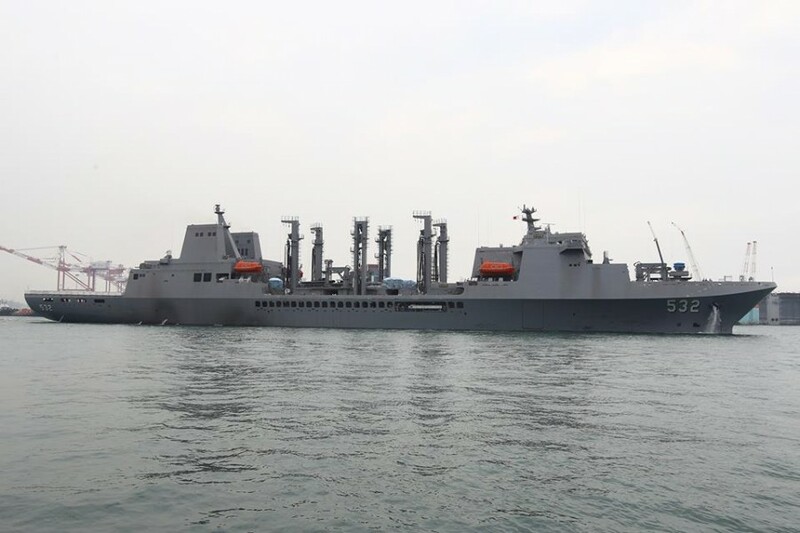 Panshih has two 40-mm cannons, two 20-mm Phalanx CIWS (Close-In Weapon System) and short-range air-defense system Sea Chaparral, based on Taiwan-made TC-1 missiles (itself derivate of AIM-9L Sidewinder). 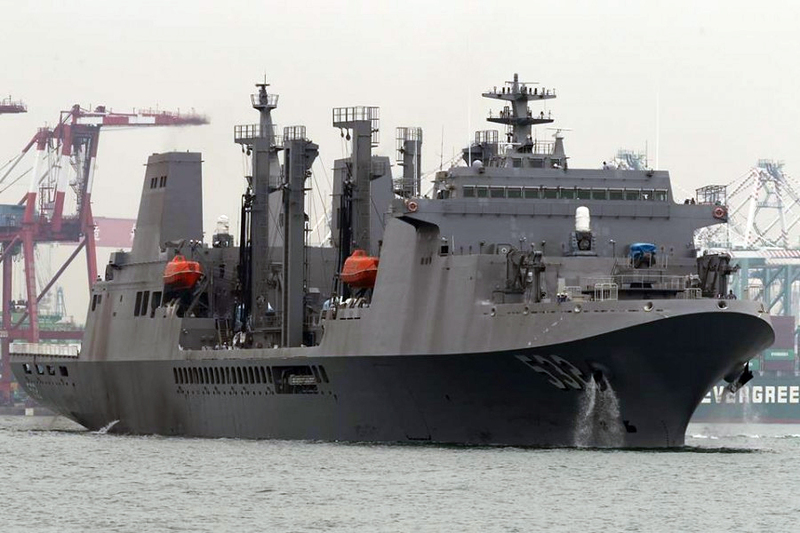 In addition, Taiwan’s new combat support ship does not only carry vital supplies for ROCN’s warships but is also able to accommodate SH-60 Sea Hawk (Sikorsky S-70) or CH-47D Chinook helicopters. Combat support ships usually do not get the same amount of attention like major combat ships. However, they are absolutely crucial for keeping fleet on the open sea, especially under combat conditions when replenishment in ports may be restricted. In a peacetime, AOEs can conduct HADR (Humanitarian And Disaster Relief) operations. For that purpose, Panshih is equipped with medical facilities, including operating room and three regular and one isolation ward. According to Gavin Phipps, Jane’s Defence Weekly reporter, delivery of Panshih comes as Taiwan’s government looks to invest heavily in the RoCN as a means of boosting the island’s defence capabilities. The Ministry of National Defense took delivery of the island’s first indigenous Tuo Jiang-class missile corvette earlier in January, and the government approved a $94.46 million four-year design contract for an indigenous submarine in December 2014. The government increased its 2015 defence budget to $10.7 billion, a 2.6% rise from 2014. Prior to that increase, the island’s defence budget had been in decline since 2009. The budget was passed by a legislature forced to take a more bipartisan stance on defence spending and production of indigenous weapons systems, as the island faces both a growing threat from China’s fast modernizing military and current U.S. government opposition to the sale of advanced weapons platforms to Taiwan.